Speaking of Hollywood Studios, did you know that I’m a huge Star Wars fan? The ambitious plans to bring Star Wars to life in Disneyland® Resort and Walt Disney World® Resort include creating Disney’s largest single-themed land expansions ever at 14 acres each. Yowza! Get your friends to go vote for your Chiquita smile and increase your chances of winning. And while you’re at it, we’ve got an exclusive Chiquita giveaway for you right here on the blog! No purchase necessary. Must be 18+ US/DC/CAN (excluding Quebec) resident to enter. Giveaway ends 6/10/19. 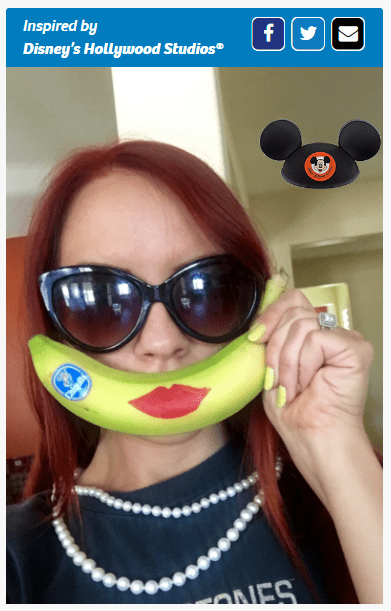 Disney has loads of lovely recipes right at the resorts that use Chiquita bananas. I’m personally digging the look of this Bread Pudding à la Mode with Chiquita Bananas Foster Sauce, available at ‘Ohana (one of my all time FAVORITE Walt Disney World restaurants) at the Polynesian Resort. Which recipe excites you the most? What resort inspired your Chiquita smile? Share in the comments below! That picture is hilarious! So beauty girl!! I would love to win.